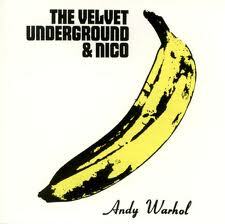 Many people would recognize the Andy Warhol stylized print of a banana as the Velvet Underground’s unofficial logo. Many of the same people would also know that the banana was created by Warhol, who often collaborated with the band. But who owns the rights to the iconic print? The Velvet Underground recently filed a trademark infringement lawusit that claims that the print was taken from a newspaper ad that was part of the public domain. The Andy Warhol Foundation currently owns most of Warhol’s copyrights, which are valued at over $120 million. The foundation earns about $2.5 million a year by licensing these copyrights. When the foundation decided to start using the banana print as part of its copyrighted repertoire, the band sued. According to the lawsuit, the band wants a judicial declaration that the foundation has no copyright protection for the banana icon. I love when hippies or their heirs fight over money, don’t you? As Michael says, the Warhol banana evidently became a sort of de facto logo for the band, but they never attempted to perfect those rights by registering the mark, either — which of course would have been dicey, considering that the logo was someone else’s creative work. They did have permission to use the banana logo — Warhol made it for the album cover. But he didn’t give them any other permission, so, as Michael explains, the question is the extent of the rights included in this case of a work made for hire. Lawyers and intellectual-property experts say that to win its case, the Velvet Underground will have to show the design has come to be associated by the public with the band itself. Okay, maybe not so easy, but this is one old banana! And Warhol’s estate can’t really claim trademark rights in it, you’d think. Pretty interesting issues. Glad they are finally getting around to settling questions involving these old fruits.